I will add to this as and when more questions come in. I hope it helps you to understand more about the intricacies of this wonderful drink! Good grains are simply grains that will produce milk kefir. It’s highly unlikely that you will be sent grains that don’t work. They may be sleepy after their journey in the post to you .. and need time to start working at their best .. but you can still drink the resulting milk while they get themselves up to speed. Some grains, as you use them over time, may develop a darker colour. This may be because you have frozen them, over-heated them or the outer layer is a little crusty and maybe a bit harder than usual. This can happen if they’ve been dried (some people dehydrate their grains to store them, but a freezer is more efficient, although could potentially still offer wear and tear) and also when they are getting old. You could take these coloured grains out of a ferment and try making some kefir milk with it. If they don’t work, you can throw these away. Having some amongst your good grains, won’t affect their performance, but you don’t need the unproductive ones in your collection. If your whole collection goes dark, try making kefir with them and if there is no kefir, you may still find that the old grains can still multiply to produce new ones. If this happens, you can keep the new and discard the old. Another highly debatable topic! Lately I’ve read anything from 1 tablespoon of grains to ½ cup of milk up to 1 cup of milk will work, but I’ve read so many writings on this subject and have lost count of how differently everyone makes their own kefir. I’m going to be a bit shocking now and say that I’ve not measured mine for months. They’ve been multiplying like crazy and as they do so, I just use an extra jar when I think there are too many for the existing number. I just leave a pile on the foot of the jar (evenly distributing my grains into piles) fill the jar with milk and fill the jug to the neck of the jar with milk, then move to the next jug. I’m telling you this because I want you to know that you can make kefir milk this way. And it will still taste great! You just need to keep an eye on the ferment a little more closely if you don’t measure, because the grains will mature at different rates each time. Having said that, they do this with room temperature as well, so it’s never an exact science. However, I don’t want to overwhelm you, so let’s pull back a minute. When you buy your kefir grains, they will come with a set of instructions. You can work with the measurements the company you buy from suggest and then find your own feet thereafter. Fermenting is very much about ‘getting in touch’ with your food and understanding it. Setting rigid guidelines can take the fun out of it and also make you worry if you don’t have the exact amount of grains. Or you could be daring and fill to the neck and see how it turns out. This is half the fun of fermenting, playing around with food and drink and seeing what happens! If you leave a milk ferment for 12 hours, it is fermenting by then and changing it’s chemistry, so at any point forward, you can drink it. Kefir milk will be thicker than fresh milk, so you’re looking to see that change throughout the ferment. If in doubt, you could stir and see if the whole jar of milk is looking thicker. You may also notice tiny bubbles forming. There are finger subtleties to visually being able to tell when a ferment is ready, but I have always found that the easiest way is to see it’s thicker and to taste it. A tangy, sour taste on the tongue will confirm that your milk is ready to drink. If you like it tangier, simply ferment for a little longer. If the milk has started to separate into curds and whey (heavy white milky chunks forming at the top of the jar and a cloudy white’ish/clear liquid at the bottom) it is over fermenting, although still drinkable. So long as it hasn’t been like that for many days, because it will then be extremely sour. If you catch it early enough, just strain the milk from the grains and stir the milk solids and liquid back together. Or pop in a blender. I’ve read that very mild kefir milk can have a laxative effect and very sour constipating, but that catching at it’s hotspot garners no reaction. As always, keep an eye on your ferments. Remember your grains are like babies, or pets. The need love and attention to thrive. Will My Kefir Milk Bubble Over or Explode? Again, there is much to read about this in fermentation literature. In short, some suggest not filling a jar more than ¾ full. I have always filled mine to just below the neck of the jar and only once, when I broke that rule and went even higher, did the milk seep out of the jar and cause a little mess on the work top. Some people ferment kefir with muslin over the top of the jar and no lid. Kefir grains thrive on oxygen, so using a clamp down jar feels safe and productive to me. They hold the oxygen in the jar whilst allowing carbon dioxide (at a certain pressure) to escape through the rubber seal, which oxygen is unable to do. Be sure to at least spend on thick, quality glass – they’re still inexpensive. 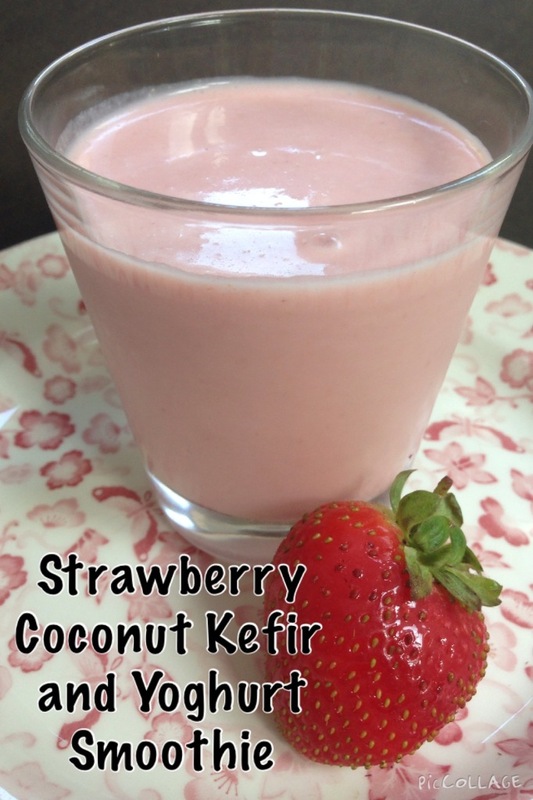 The longer a kefir milk is kept airtight, the more carbonation will inhabit the milk. I store ours in just with an opening in the lid. It’s still mildly carbonated, but your option is there to store differently if you’re looking for more bubbles. If you ever do decide to ferment with muslin (not something I can advise, as I haven’t tried it and won’t be going that route) do ensure the muslin has no holes and is secured firmly with a rubber band or string. Flies are remarkably dexterous at finding their way into ferments and once you’ve found a creature in there, well, it won’t kill you, but … I wouldn’t want to be removing them, then eating or drinking the contents. Home-made kefir milk is runny enough to drink. I have found the cow’s milk to be thinner than the coconut after usual fermenting times. To make it thicker, if you’re using grains, you can remove the grains and leave the milk out on the work top until it’s the consistency you like. I haven’t tried this because it does also mean the milk will turn much more sour. My coconut kefir milk turns out really creamy and pretty thick, even at it’s thinnest, so I’ve not worried about changing that status quo. It’s wonderful as it comes, in a smoothie, ice cream or poured over desserts. And I make it into cream cheese too! Sometimes, you may take the coconut milk from the fridge to find it’s formed a lovely thick, solid cream on top. When this happens, you can see the watery whey below. Occasionally, it may look as though almost the whole jug may have turned to thick cream, with just a little watery whey visible at the foot of your jug. When this happens, I use a long beer brewing spoon to push through the cream (it can be really thick and has to be done carefully) and then stir everything back into together. You will be left with a lovely, thick consistency and will pour beautifully. I have read that it’s best to start with tablespoon with each meal at first. Or less, if you feel that’s right for you. You should know when you try it. If you find it a little sour, add a teeny drop of honey and mix it in. You’ll be amazed at how your taste buds will change over time. Next day I had 2 spoons. Within 3 or 4 days I ramped it up to a bowl of cereal with plenty of kefir and the gurgling stopped. I just loved knowing that it was working. It was like my body was telling me something good was happening! I’m not a medic and therefore not qualified to give advice, but I did find taking probiotic pills had no positive effect on my body at all. They usually contain only 1 probiotic, where as kefir will have multiple strains, plus amino acids, enzymes, pre-digested nutrients, amino acids, vitamins and of course, energy in the form of calories because you are drinking a milk, not just taking a pill. Some people supplement their diet with both kefir/fermented food and probiotic pills. I personally don’t feel the need, but you should do what feels right to you. Listen to your own body. The evidence for the benefits of milk kefir, water kefir and fermented food and drink in general is mostly in people’s own stories of being healed/keeping well. Scientific research (listed on my Main Menu and in the post ‘What is Kefir?’) detail lab research on rats and mice. Probiotics are a healing thing, so keep in mind that you may expect to experience a reaction of some sort. Remember that you will be feeding your body with friendly bacteria that will be rallying around to try to protect you from future germs and fight any existing pathogens (bad bacteria). Bad bacteria are pretty toxic and any healing process we put our bodies through (fasting, cleansing, adding fermented foods) tends to change our body chemistry in some way, so just be aware and take it slowly. If you’re in any doubt, read about it some more. Even ask your own practitioner. Perhaps they will have advice for you as well. Ultimately, it’s your body you will be feeding, so the final decision will rest with you. What Happens if I Drop Kefir Milk Grains on the Floor? Rinse them immediately, but not in water that contains chlorine or fluoride. Filtered water is ok, if you have a proper filter installed in your tap at home. Filter jugs aren’t adequate. They don’t remove the elements just mentioned. It’s possible to remove some chlorine from water by just leaving it out without a lid for 24 hours. However, some strains don’t dissipate easily, such as chloramine. The only way to be sure of what your tap water contains is to call your local water authority and ask. are the waters best used with grains and all ferments. In the case of kefir grains, only if absolutely necessary. It’s not advised to wash them generally. It can affect their kefir producing qualities negatively and could even kill your grains if you used often. In short, yes. Kefir grains will work well for you all year round, although it’s advisable to give them a couple of breaks for a few days. That’s really easy to do if you make a big batch of milk prior to resting them. I often need to halt production and simply leave all my grains in a 1 quart/ 2 pint jar, full of milk to the foot of the neck. One week later I will refresh the milk by straining off the sour milk (usually not very drinkable, but you can test it and see!) and pour fresh milk onto the grains. How are you finding this kefir series? Someone gave me a small jar that’s 3 quarter filled with mature milk kefir. It has been sitting in my fridge for months. Now that I’ve finally bought milk and plastic strainer, I’m not sure if the milk kefir has been left too long in the fridge. I dare not seek advice from the giver due to feeling guilty for procrastinating. What can I do with it now? My grains were grown in cow milk but I am using goat milk to make the kefir. The grains are multiplying well but they aren’t fully fermenting the milk – I can taste that not all the lactose is being digested and the taste is very mild even after several days. Any ideas?? Shall I start again with grains grown in goat milk? Or rinse them? In my experience, your grains should work in either milk. Since they’re multiplying successfully, I’m wondering if the balance of milk is right for the grains. If they’re not fermenting after several days, perhaps you’re giving them too much milk? I would firt try reducing the volume and see how that works. Something happened to my husband’s cow’s kefir when he took it away with him last summer. He left it in various warm places and they still took a week to ferment. They’ve only ever taken 48 hours before and have done since returning home. So odd! With that in mind, my other suggestion would be to check the room temperature with your current routine and see if it sits between 68-75 degrees Fahrenheit. Perhaps somewhere a little warmer may encourage the grains to ferment the milk. You say ‘several’ days, but that could be 3 or 4. Perhaps they need a warmer place to kick start their work better. I’ve had readers use their airing cupboards before now. Our utility – where I ferment everything – sometimes reaches 90 degrees F (washing machine/boiler and dryer in there, plus a veluxe window) and fermenting is never a problem. I would worry more about food/drink fermenting in cooler than an over warm place. You just have to keep a closer eye on them in warmer rooms because they can change really quickly.